This morning at Agritourusmo San Giusto we enjoyed a leisurely breakfast with our new friend and fellow pilgrim, Johann of The Netherlands, did our push-ups, then headed out at 9:00 for an unexpectedly challenging day. The push-ups are a practice we began about ten days ago — three sets of 20 push-ups (or however many we can manage) and today Johann called us on the obvious. We’d been doing “easy” push-ups, not touching our nose to the floor. At his insistence we corrected our form and, of course, reduced our total count. Even though he reduced our sense of satisfaction at an ever-increasing push-up total, we were coming to enjoy our new fellow pilgrim. We had met Johann a few days earlier between Ceselli and Arrone and then we discovered him last night at our agritourismo. We shared dinner and conversation and found him to be sincere and enjoyable. He’s an experienced pilgrim who’s walked many hundreds of miles, including to Santiago from his home in The Netherlands. Our agriturismo was a couple of km outside Poggio San Lorenzo, so our first task was to get to the town itself. We walked down the hill, then up a hill some more, then up more and more to the town. Actually, this was the story of the whole day — up and down from town to town. After Poggio San Lorenzo it was up-down, up-down to Montelione, where we met an Italian woman who’d been a pilgrim to Santiago. She asked us if we’d walked there, then joyfully told us in Italian about her Camino Frances experiences. 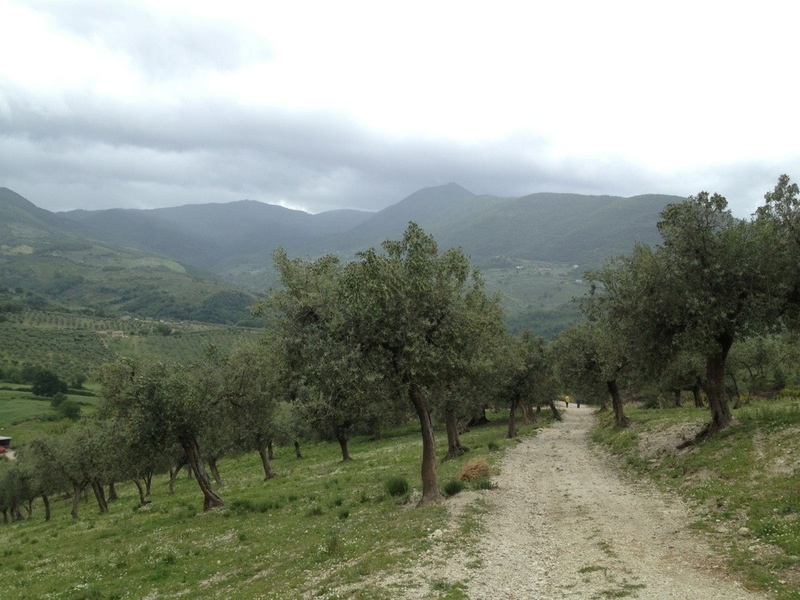 We understood a surprising amount, through the universal language of happy camino memories. As we entered town Andreas ducked into a grocery store for his lunch and the rest of us headed to a bar just off the piazza for panini and potato chips. We gave thanks that our day had been relatively dry so far. We headed down and out of Montileone, past the Church of Santa Vittoria from the 12th century, crossed an ancient bridge across a small creek, then trudged up an enormous, concrete-paved hill path opposite the town. At this point we realized this camino is actually very physically challenging. We have walked up and down countless hills. In fact, we have been in hills or mountains basically the entire time. Unlike the Camino de Santiago there really are no long, flat stretches. You’re always either going up or going down. The result is lots of exercise. In fact, when we arrived in Poggio Maiono there was a .20 Euro outdoor scale. I popped a coin in, stepped on it, and discovered I’ve lost 4-5 lbs (2-3 kilos) in weight in just 10 days. What a nice surprise! As we enjoyed cafe lattes and caldo chocolates in Poggio Moiono the rain began, briefly turning to hail before continuing as cold rain. 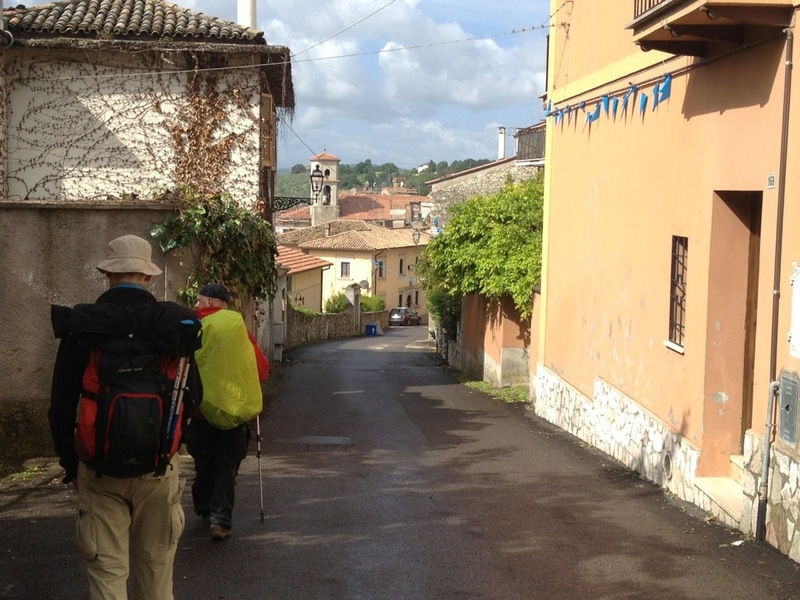 We waited it out, then began the final two hours of our walk — to Ponticelli. 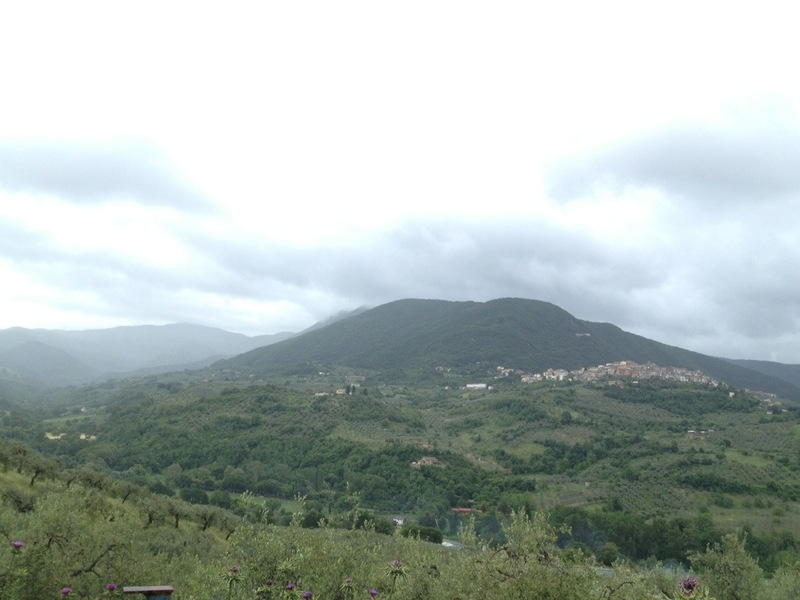 Unfortunately, after leaving Poggio Moiono the rain began in earnest and we each realized our rain gear would be on for the rest of the day. 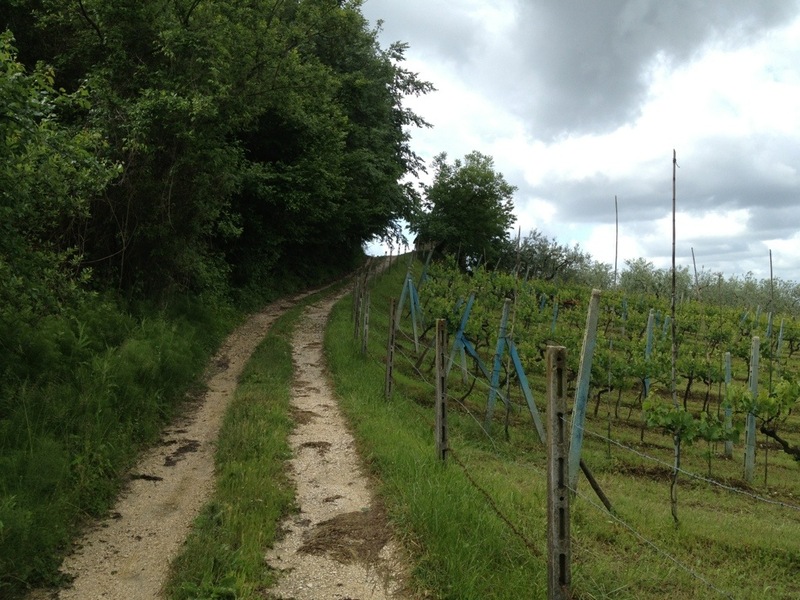 As we neared Ponticelli we heard rustling in the bushes and noticed a brown boar ahead in the pathway. “Look out!” said Sebastian in excited German (I learned the translation later), “they can be dangerous.” The boar ran off, and then a few moments later off to the left we noticed an adult wild boar, two feet tall, brown with light brown stripes, and three of her piglets. They scurried around as they heard us, and we realized we didn’t want to be in the way of a mother boar’s wild charge. We hurriedly continued walking and soon the boars were behind us. 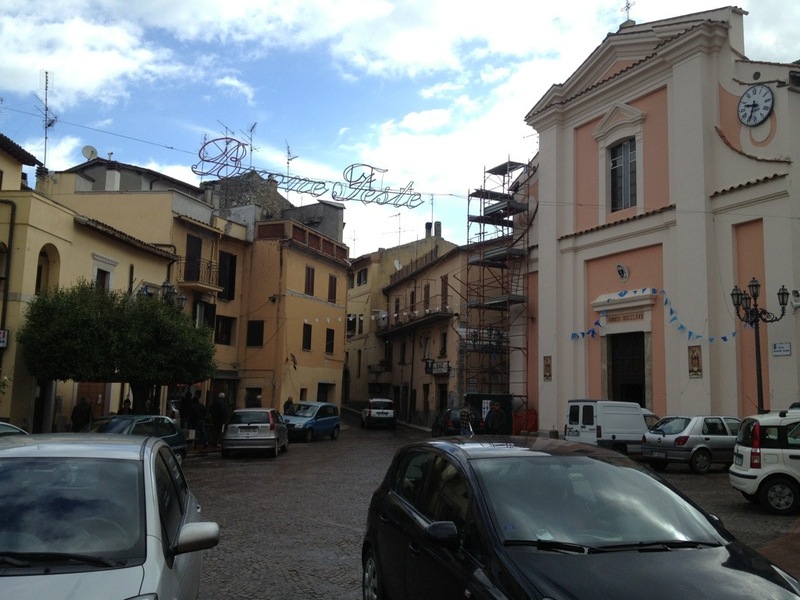 After eight hours of tough terrain the town of Ponticelli appeared before us. Our next challenge was where will we sleep? Johann came to the rescue. “Why not my hotel?” he said. Soon a driver from his hotel appeared and before long we were ensconced in warm room at the Salaria Hotel, a 10-minute drive from hotel-free downtown Ponticelli. Warm showers, pizza and laundry filled the evening of a cold and challenging day of rain, hail and wild boars. This entry was posted in Via San Francesco 2013 and tagged Agriturismo San Giusto, boar, Montelione, piglets, Poggio Maiono, Poggio San Lorenzo, Ponticelli, Salaria, Santa Vittoria, Sebastian by SandyBrown. Bookmark the permalink.